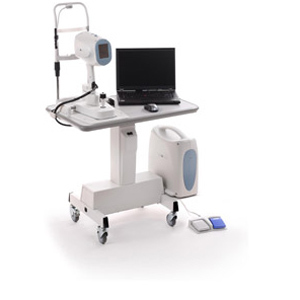 Optical coherence tomography (OCT) is a non-invasive, non-contact diagnostic imaging technology that provides high resolution cross-sections of various parts of the eye including the optic nerve, retina and irido-corneal angle (front part of the eye). When used to evaluate the retina, it provides high resolution scans of retinal anatomical parts allowing the ability to detect and monitor various conditions such as macular degeneration and macular edema due to diabetic retinopathy. OCT can also be used to evaluate the integrity and quality of the optic nerve. It is able to detect small changes in the retinal nerve fiber that can be attributed to damage due to glaucoma. Vision loss due to glaucoma cannot be restored; therefore early detection is extremely important. If not treated, glaucoma can lead to blindness. When used to scan the structures of the front part of the eye, it can provide information on the irido-corneal angle (the drainage system of the eye). For this quick screening, the patient is simply seated in front of the machine and asked to focus on various images while the scans of the eye are being administered.